Today markets were impacted by multiple negative news including the domestic news on the banking sector irregularities and global news from Cyprus triggering the concern of a chain reaction. US markets saw a sell off at opening, but recovered from lows, but closed negative. Markets will be watching and reacting to the RBI news on trading hours and it is strictly advised not to have any intraday positions until the news is settled and market stabilizes. Markets have already factored in 25 points cut in tomorrows RBI meet, so a major sell off or rally is not expected unless there is a big surprise in either direction. 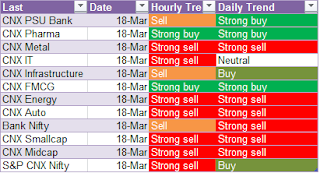 Pharma, FMCG and PSU Banks are still holding positive in daily charts, while all other sectors especially Auto and Metals are negative in both daily and hourly charts. Nifty support level is 5800. Sustaining this will result in further bearish mood. Critical resistances are 5850 followed by 5875-5900. Support levels are 5825 – 5800 followed by 5780. I expect this to be the maximum low today. As long as Nifty is below 5825, overall trend is bearish and no intraday longs are recommended. Reliance – Buy above 837 for a target of 842 with SL 828. If 842 sustains, then 846 will be next target. L&T – ended in positive due to the stake sale news. 1525 to 1535 range is a no trading zone for L&T, since the stock is unlikely to make decisive moves in this band. Buy L&T above 1535 for a target of 1545 with SL at 1505. Cipla – Based on sector analysis, Pharma is positive. We had few successful trades in Cipla in the past. I would like to re-enter for long trades tomorrow. Buying is recommended only above 392.50 for a target of 395-396 with SL at 387.50. Sustaining above 396 is bullish for Cipla in the short term. Bajaj Auto – We made good profits on Bajaj Auto sell today and the stock ended close to the level of 1815 in the pre-market call. Sell below 1805 for a target of 1790 and 1770 with SL at 1830. Tata Motors – Below 285, the stock could touch 283-2. Below 282, 280-79 is the target. SL for shorts is 288. Wish you good luck and feel free to raise any queries. Subscribe for the posts in your favorite reader. Please click on the RSS button in the age. Those who have not tried an RSS reader, please try www.feedly.com which is one of the best RSS readers for Chrome, Android and iOS. Tata Steel Update–Next target is 290. Where is Nifty heading to ? Bajaj Auto - Update 20 points profit. NTPC Outlook – Will it move up ? Tata Steel–70 points fall, what next ?